Absolutely terrible. The plot needs some series structural work,the story needs to be revised and edited, the pace in the couples' relationship is going WAY too fast... oh boy, the list is endless. I hate how the author puts exclamation marks in practically every other sentance. Exclamation marks should not be used so easily; they should be revered. The characters in the story need a whole lot of development because they're too flimsy to be anything but a crap load of words strung together in a distateful manner. No offense to the author, but this needs a ton of work. My rough drafts are better than this, and my rough drafts usually just start off with me putting an idea to paper, so they're creative but not a good story in any way. This shouldn't have been published in my opinion. Absolutely loved this book! Couldn't put it down once I started reading it! Lily is an everyday girl until two days after her eighteenth birthday her life changes! The brother she loved her whole life went missing four years ago only to attack her at an attempt to take her life! It is the Prince Tharin steps in and rescues her, forever changing the course of her life! She finds out that Tharin is her betrothed, the son of one of many elf clans. He is there to bring her back to her world where she, a princess is to marry him and unite all the elf clans before a war breaks loose. Tharin, along with his twin brother Tolan and their cousins must get Lily and the best friend she would not leave behind safely to their realm all the while being hunted by ogres, wizards, and evil elves all planning to kidnap Lily and prevent unity of the clans! But why is her brother the leader of one of the evil clans? Lily willingly follows in order to find her brother and make him see that he is being manipulated and bring him home safely. What I loved most about this is how Tharin and Lily, although betrothed, don't fall madly in love at first sight like other books! Tharin is actually in love with Kalis another elf back home and resents the idea of him having to marry Lily. Lily is turned off by Tharin"s constant nastiness and ability to make her cry, but slowly they open up to one another and realize that they do have strong feelings for each other. But something or someone is always standing in the way keeping them from being honest with each other about their feelings! I love how throughout reading I was constantly holding my breath to see if one of them would own up to their feelings towards the other. Along with their quest to make it out alive and the emotional angst, Lily and Tharin grabbed me into the story and I couldn't get enough! Can't wait for the next one!!! But the question is, how can I stand the wait? The Binding is a paranormal story about Vulcans...er um sorry I mean elves. I enjoyed reading about Tharin and Lily. Though we spend half of the book with Tharin in denial about his feelings about Lily, he finally comes to terms with it. Ah what would a story be without some type of inner struggle. I did like that it was not love at first sight, we got to see them develop feelings for each other. It was refreshing to see. I enjoyed the fight scenes and of course the tension between Tolan and Julia. They were down right hilarious. I haven't enjoyed such antics by a side couple in a while. The book sure grabbed my attention.Lily's 18th birthday has come and gone, and her brother Lucas is not far from her thoughts. He disappeared 4 years ago, leaving Lily alone. While out running she gets attack by none other than her brother and is saved by the handsome Tharin. He is rather curt and rude to her in the beginning. Though most of it is because he is mad at himself for having feelings with Lily, when he has promised himself to another back home. He can't understand why he keeps thinking about Lily when he should be thinking about his true love. So he takes it out on Lily because he is angry at himself. Lily, Tharin, Tolan and Julie with 3 cousin bodyguards go on a journey back to Velesi where Tharin and Lily are to marry. Lily is definitely not going through with all that, heck no, she is going to find her brother. I loved how Lily gave as good as she got. Anytime Tharin let into her, she let him have it right back. I have always loved reading about a female lead that doesn't let the leading guy push her around. She has a firm head on her shoulders and is not going to marry a guy who is in love with another girl, or she thinks is in love with another girl. He he.Along the way they face many obstacles and when Lily's powers seem to be rising to the front problems seem to be sprouting up everywhere. More than Lucas is out to capture her and the princes, several other creatures are after them and they will stop at nothing until they have them. Who can they trust? Will they get Lily to Velesi safe? And will Lily be able to save her brother who is believed to be lost?I enjoyed reading The Binding. I sure can't wait until the next installment. L. Filloon has created a magical world that revolves around the human world. It was an interesting read, I would recommend this book to anyone who loves Fantasy/Romance and are looking for something light. Especially with the banter between Julia/Tolan and Tharin/Lily. It sure made me smile! 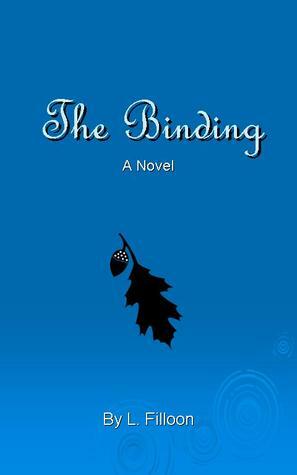 L. Filloon, the auther of this book, contacted me via my mailbox on Goodreads giving me a code to purchase "The Binding" for free. That hasn't happened to me before, so needless to say, I was excited, lol. But it also made me really nervous- what if I didn't like it? Then I'd feel guilty, yet still obligated to write a review. And I hate writing negative reviews, which is why I hardly ever do.Thankfully, I had nothing to worry about! You've read the premise, so I will just say that "The Binding" was full of adventurous, humorous, suspenseful paranormal fun. My only complaint about this book would be the lack of romance. It was there, but not as much as my self-proclaimed hopeless romantic self prefers. (view spoiler)[I was very disappointed we didn't get so much as a real kiss! (hide spoiler)] But there was so much action and the (good) characters were all so enjoyable, that it really made up for it. Not to mention the fact I'm guessing we'll have more of it to look forward to in book two. Lily, Julia, Tharin, Tolan, Cessa, Mellis, Alorn and Phoris will all have you anxious for more of each of them by the time you've read the last sentence (which also happens to be a promise and shocking revelation all in one). I was definitely impressed by this book..The story..the characters..how it weaved n ofcourse i always love Arrogant princes handling princess ;)And damn eagerly waiting for that sequel to come soon :)Sri. I wasn't sure what to expect but I love this book. From the beginning I found myself immersed in the story and couldn't put it down. Character development is very strong and I really enjoyed the book because I like the characters and how they evolve throughout the story. The heroine, Lilly, is humble, caring and although insecure, has an inner strength about her. I love her unassuming ways and the fact that she is true to her heart and is someone with ideals and values. The hero in the story is strong, determined, fearless, and loyal but has a softer side which you wouldn't normally know but is shown when the author tells the story from his point of view. I also really like all the secondary characters and how they interacted with each other through the story - it was a great supporting cast. Even the villains were interesting!I love the fact that both the hero and the heroine aren't perfect and they battle internally over how they think, feel and act. Telling the story from both sides was brilliant because it allows you to see what each character is thinking. At first Tharin comes off as a bit of a jerk but after reading his point of view, you come to understand why he acts a certain way and you see that his actions are due to a strong love he has for Lilly. The sexual tension in the book is amazing. Although nothing happens physically, it leaves you hoping and waiting as you know both parties truly want one another. I'm starting the second book in the trilogy tonight and hope that it's just as good, if not better than this one! I love this book! And I especially love the elves. The Binding is an urban fantasy that’s fast paced, full of action and has a great storyline. The author’s debut is a wonderfully written tale of young adult urban fantasy with fast pace actions, adventure and tender moments of first love. It starts off innocently enough with a run in the park and ends with literally running to the border to stay ahead of danger and staying alive. The book starts off at a fast pace and stays that way until the end. The characters are individually likable and by the end it feels like you’ve known them to a part of your circle of friends for years. The two main characters, Lily and Tharin, are likable and you root for them even though at times you want to shake Lily. But as you read, she develops into a strong character who keeps Tharin on his toes. At first they don’t get along despite being thrown together by a treaty between their clans…but things change, as they always do, as they make their way back to Tharin’s realm. There’s also Tolan and Julia, Tharin’s twin and Lily’s best friend and three body guards who happens to be the twin’s cousins (Alorn is such a warrior!). I highly recommend this book if you’re into young adult urban fantasy. You’ll fall in love with all the characters, but most of all you’ll love the story about Lily and Tharin. The ending is an unsuspected surprise…which was so good! Love this book and I can’t wait for the next one! I give this book 3.5 stars, which, considering the fact that I don't normally enjoy YA novels, is quite generous. It's not that I disliked the book, actually, I did enjoy it to be honest. It reminded me a bit of The Lord of the Rings with all the orcs, elves, trolls and other creatures featured throughout the book. Of course the story itself was completely different and original in and of itself.What I liked most about this book is how easy it read, not in a lazy way, but more in a fluid way. I liked that it could appeal to amny ages;teens to young adults could enjoy the storyline and plot, and even older readers could enjoy the same with the added benefit of mature sentence structure and vocabulary. THis was a refreching change to other YA novels I've read with their simple sentence structure and mediocre vocabulary.But sadly, it still doesn't do it for me. I'm still on the search to find that YA novel/series that will completely change my opinion for the genre. And this book didn't quite do that. However, I would gladly recommend this book to those who favour YA novels of this kind. In the meantime I will continue my search for that opinion changing YA novel. I know it must be out there. If there is one thing I love that doesn’t get much exposure is elves. I absolutely loved elves so when I found out this book was about elves I was super excited!The plot is really fast-paced and when I started the book I didn’t really enjoy it all that much. However, the more I read the less I could pull myself away from the book and I found myself really liking the book by the end.I liked Lily for the most part even though I thought she cried all the time and it was kind of annoying. I liked Tharin too, he seemed pretty awesome.One thing that kind of annoyed me a little about The Binding is that it had really short chapters and changed perspectives between each chapter so you would get a really fast glimpse into Lily’s mind, then a fast glimpse into Tharin’s mind.Overall, I really enjoyed reading The Binding and I’m interested in seeing what happens next considering the ending of this one. I thought the elf spin was pretty awesome too. LOVED LOVED LOVED LOVED!!! !What a total surprise! I didn't know what to expect but what I got was a whole new spin on a new type of world that I just couldn't put down! I was left hungry for more. Review Posted atRuby's Books If there's one thing I love more than anything is a good fantasy book. The Binding was, in my opinion, more than just "good". It was more than great, actually.The first thing that caught my attention was that we don't have just one perspective, but two. The book is written in first person, but we get to see Lily's and Tharin's take on the action, alternatively. That's where I, as a reader, tip my hat to the author. Seriously. As a reader that's weary of books written in 1st person, it was so refreshing not having to worry about that. Because you get two views on the same scene (or almost the same), it's like actually seeing the entire picture, like having eyes on the back of your head also and seeing every little detail around you.The world we find in The Binding is new, fresh, surprising. Out of all the supernatural creatures, elves are the least used, so it was a nice change to see them as the main species in a story. You also find ogres, orcs, demons, wizards, wolves and a few other creatures I've never encountered before.The characters were amazing. Lily, the heroine, managed to surprise me a lot. Just when you think you have her figured out, she does or says something that changes everything you think you know about her. She can be both strong and weak, she can be fair and she can overreact at some point, she can be happy and sad. The one thing that is constant through the entire book is that she's an extremely friendly person. And when she cares about someone, she'll do whatever it takes to protect them, even if it means endangering herself. I liked her friendship with Julie. It's one of those really rare friendships and I for one haven't found them in a lot of the books I've read.Tharin was a very interesting hero. I'm sure that if the book was told only from Lily's perspective, I would've wished to smack him a few times. But since I got to be inside his head, see why he said the things he said, why he acted in a certain way, I can't imagine a better hero. And I liked that Tolan, his twin brother, wasn't as perfect as I first thought. There were times when I laughed alongside Tharin at his brother's behavior. So don't think that one twin is flawed, while one is perfect. They both have faults as they have moments of utter perfection. That, in my opinion, makes this characters real, it gives the idea of layers upon layers and it just made me want to uncover everything about them.I loved the ending. It made me groan and scream in frustration, but the cliffhanger is AMAZING! I think it's best if I say there are at least two cliffhangers, not just one. I am impatiently waiting for book two.If you like fantasy, paranormal, young adult, you should definitely try The Binding. You won't be disappointed! I am not one to normally read books about elves or fairies. When I saw The Binding I had to check it out. The author doesn't write about tree dwelling fairies, no, elves are the star of the one. I don't know much about elves except that the keebler ones make some rocking cookies. :) The Binding is the beginning for Lily and Tharin. Lily is part elf and doesn't know it until her fiancé, since birth, saves her life one night. Tharin is none too happy to be saving Lily, but he always keeps his word. plus he wants to keep peace amongst the elf clans so he has to marry Lily even though he loves another. They set off with Lily's BFF Julia and Tharin's twin Tolin to go back to Veslei. Things are not what they seem when it comes to Lily's brother Lucas. Before she gets to find out the truth, everything goes wrong.The author writes an interesting story through the eyes of both Lily and Tharin. She uses multiple POV's and gives you both of their perspectives for each scene. The fact that she does this adds a little something to the story. It no longer seems one dimensional. The one thing I wish that the author had done was explain things a little more. I like that some things are hidden because it keeps you wanting more but maybe if we knew more about Lily's parents or maybe the powers the elves have. Tharin is a character you love to hate. He comes into the situation basically blaming Lily for the fact that he had to leave Kalis, the girl he loves behind. It's not Lily's fault that he has to marry her. She may be part Elf but she had absolutely no clue they even existed. He starts to have feelings for her, which is no surprise since he has to marry her, but he hates himself for even having feelings. He spent years disliking this girl and now he starts to care for her.I think my favorite has to be Tolin and Julia. Julia has had a rough life. When Lily brings her along with them she finds her salvation in Tolin. They argue and fight but I think that is because it is easier than admitting their true feelings. Tolin is good for Julia. He shows her what love really is and that it doesn't require you being slapped around.Overall thoughts are that it is starting off as a pretty good series. If the author sticks to this path the books can only get better. I can not wait to see wait happens next. I was bummed that there was a cliffhanger but at least I don't have to wait too much longer. I think the next one comes out in November. This is a definite recommend for your TBR list. This book is YA but there is some violence so I recommend to readers age 15+. At the beginning of the story, Lily, comes off as somewhat of a loner – especially since her brother, Lucas, had disappeared on his eighteenth birthday. Eighteenth birthdays seemed to be jinxed for Lily & her family. Two days after her own big day, events unfold in such a manner that it leaves her world upside down. She is attacked by her own ‘missing’ brother only to be saved by a complete stranger who keeps a panther as a pet!Tharin & Tolan, twin princes, appear in Lily’s life only to divulge information that shocks Lily further. Raised as a mere human, Lily is actually an elf princess who is betrothed to Tharin. Lucas had been initially abducted by the ‘Ange’ and he turned to their side. They explain that they have to take Lily to their ‘land’ Velesi at the earliest in order to keep her safe. Lily refuses to leave without her best friend Julia and so, after Tolan brings Julia with them; their journey begins with their bodyguards – Alorn, Mellis & Phoris. (Who also happen to be cousins).What happens on the journey? Do they make it safely to Velesi? Those who are saying of course they do – do not be so sure! Lily is a mix of all the traits that a human can possibly have. She is strong, honest, brave, caring and emotional. She is a character easy to fall in love with. Tharin, the royal prince, is stubborn, moody on the exterior but caring and gentle on the inside. His sense of responsibility and honor knows no bound. Julia is a really strong girl. Even after years of abuse, she has the capability to trust and love. Tolan is the easygoing and more sensitive version on Tharin. Alorn, Mellis & Phoris are all special in their own way. Then there’s also Harlu, Ziri and Mareck! And let’s not forget my favourite Panther – Cessa!The author has woven a beautiful tale of love, honour and bravery with quite a bit of action, romance and heartache. Anything can happen in this whole new world of Elves, Wizards, Ocres and Shapeshifters. It was really difficult to put down the book once I started with it and really enjoyed the rollercoaster reading experience with Lily & Tharin. I will be eagerly waiting for the next book in the series…! The Binding (book one) is L. Filloon's first novel and I found it to be very entertaining. I liked the storyline of Elves instead of Faeries, even though when I first read the word Sidhe, I automatically thought of Fae.Lily is a interesting character, her parents are dead and the only real family she has left, her brother, disappeared several years earlier. She was finally establishing some type of home with her foster mom when out of nowhere someone tries to kill her while she was jogging. If it wasn't for the two handsome guys in beanies she probably would have been dead. The strange thing is, is she was pretty sure it was her brother Lucas who tried to kill her. Then these two mysterious guys tell her she is a princess of the Willow Clan. Betrothed to one of the handsome guys Tharin and he has come to take her home to Velesi. Now some might like being told they are a princess but not Lily. Lily is a strong character, she is sometimes brave, sometimes afraid, but she holds herself together fairly well. I am glad that she is strong because I hate weak female characters. Tharin, is strong and a bit prideful. He is the prince of the Oak Clan destined to be King one day and sometimes it makes him a little arrogant. He is a very serious character he takes the fact that one day he will be King of the Oak Clan very seriously. Sometimes it makes him come across a little harsh when it comes to Lily, but that is not the only reason. Tharin doesn't want to fall for Lily, he is just doing his duty and fulfilling the promise he made to his father. Deep down though he is very kind and loving, and a very likable character.All of the characters in The Binding are very likable, Tharin's brother Tolan, Julia who is Lily's best friend and the three bodyguard cousins. They have all been fun to get to know and like. Over all I think if you are into fantasy type books that you will enjoy the story of Tharin and Lily, Tolan and Julia, and three burly cousins and they travel to Velesi. I for one can't wait to see what happens next! This book is fantastic! It takes place over only a few days, but is so action packed that you just can't put it down!Lily has just turned 18. While out jogging, she gets attacked by her brother, who mysteriously disappeared 4 years ago. Tharin is her saviour, yet he is angry and moody at Lily, although she doesn't even know why. Tolan is his twin brother, and his complete opposite. Together, along with Lily's best friend Julia, and 3 of Tharin's cousins, the set off towards Velesi, with trouble not far behind.There was so much about this book that I loved! Lily is a strong character, even if she doesn't realise it. Despite the danger that surrounds them, Mellis still has his sarcastic wit about him. Plus there are elves!However, there were a few things that really didn't sit well with me. The fact that there is MAJOR insta-love involved in this book. I mean, it's set over 3 or 4 days supposedly, and yet Julia is telling Tolan she loves him after this short space of time? Unlikely. Also, why can't Lily or Tharin just admit their feelings for each other? They both see Tolan and Julia do it, yet neither of them can fess up. It would have saved them a lot of anger and hurt if they had just been honest.Apart from those things, I really did love this book. Plus the end had a really cool twist! 3 - 3.5 stars The Binding took me by surprise; in all its formulaic and predictable familiarity, the story held me captive until the very last page. There were a few technical issues: a general lack of editing, and very FAST pacing. However, I was too caught up in the events of the story that I barely noticed. What I liked: 1. No love triangle. 2. Effective, efficient shifts in DUAL POVs – with distinctive voices for both Tharin and Lily.3. The easy banter, camaraderie, and familial bonding added some comedic relief, and made me laugh.4. The fantasy aspect – world building, elves, royal bloodlines, the prophecy, the binding, the arranged marriage, etc. It did not blow me away, but I never got bored either. 5. The back and forth, push/pull, love/hate relationship between Tharin and Lily. There’s just something so comforting about watching Hollywood movies, because you know what to expect. You know that despite villain’s best efforts, the hero will beat the bad guys & fulfill the romance by “getting” the girl, ending with a resounding happily ever after; you know you will leave the theater feeling satisfied. That is exactly how I felt about this book. www.the-book-diaries.blogspot.comThis was such a cute story. Lily is a normal girl who one day finds out she is a Sidhe princess. Not only is she a princess but she is bethrothed to a Sidhe prince. On her 18th birthday, Lily is saved by Tharin and his brother from the evil Ange. These assassins are determined to kill Lily in hopes to bring war upon their Clans. It is the hope of the arranged marriage between Lily and Tharin that will bring the Clans together in peace. Lily, Tharin, Tolan and Julia set out to return to their home of Velesi for the marriage ceremony but run into trouble along the way. Lily will have to give up her old life for a new one for the sake a world she knows nothing about. I loved the interactions between all the characters, and the fact that Lily drops everything to become a princess and save her "brother" and her friend Julia. The world that is created in this story is one to be imagined of by everyone. It has such peace and tranquility, and also pain and suffering from what we are doing to the earth. This is such a great read, one to be enjoyed by all. I loved this book it's the first in a series about Lily Michaels whose a princess elf and doesn't know it yet. She was raised by her brother Lucas until he disappears on his 18th birthday. When Lily turns 18 she spots her brother trying to kill her, along comes Tharin and Tolan and their friends and relatives to help rescue the princess. They find themselves collecting Lily's friend Julia whose been beaten by her family. They also find evil elves and other beings trying to kill the Prince Tharin and Princess Lily. They travel through California, Nevada into Canada and to Velesi to get the Princess Lily back to Velesi for a arranged wedding. During all this a binding takes place binding Tharin to Lily. Lily finds out Tharin has a girlfriend in Velesi and just wants to fulfill this marriage and find Lucas and go home. What Lily doesn't know is that Tharin is binded to Lily, his relationship with his girlfriend is over and he only loves Lily. Upon entering Velesi someone kidnaps Lily and Julia, Tharin and Tolan are desperately trying to find her. This book was great full of action, adventure, romance times two between Julia and Tolan and Lily and Tharin! Okay so I would really say 4.5 but alas good reads doesn't give me that option. And you the say why not 5 and to that I say the constant misunderstanding, misdirection, misguided oh he loves someone else and I'll just wait to tell her how I feel was about to drive me insane even as I finished this book at 12:22 am. Seriously I enjoyed Lily her friend Julie and their fearce loyalty to each other I adore Tolan and Mellis and the others. But my rant is Tharin and stupid Kallis who Im not totally sure she wasn't up to something evil I don't care how long they've known her jealously can make you do mean things to try and gain the outcome you want. Tharin is dense and once he realizes who he really cares for he is then to dense to speak the truth and before you think I don't just adore the prince because you know I do, Lily isn't any better (stupid girl, stupid princes). I say this because I enjoyed them both just with a little less anghst I hope in the next installment.I hope I haven't given anything away although I suspected as much for this ending I was hoping for a kiss that was remembered. Ugh I'm a hopeless romantic. I loved The Binding! Lily is attacked right after her 18th birthday by her brother that has been missing for 4 years. She is saved by an elf prince, Tharin, who claims to be her bethrothed. Lily learns that she is an elf princess and the only way to save her people from civil war is to go through with the wedding. The thing is, it's going to be a tough trip to the elven land, Velesi, because now that word has spread about the princess coming out of hiding everyone is looking for her. Lily tells Tharin she'll go to Velesi with him, but her plan is to find her brother and return to her home. This book is awesome! It is written in both Lily and Tharin's POV and that makes it so much more interesting. They both have to come to terms with the bethrothal, and each other. At first I had a hard time liking Tharin (you'll understand when you read the book) but when I realized how he really felt I couldn't help but like him. This is going to be a great series, and I wish we knew when the next book is coming out because I can't wait to read it! I LOVED LOVED LOVED this book! I was entranced with this world and could not put it down. I'm in the middle of reading a non-fiction book and needed a little kick of fantasy. I'm glad L. Filloon chose to write from both Lily's and Tharin's point of view. It really enhanced the story and I probably would not have liked Tharin if I hadn't understood his motives. The Binding was very fast paced with lots of action starting on like page two. It was a little predictable at times but the ending threw me for a loop. Can't believe how it ended! Need.Book.Two.NOW. This book took me by surprise. I wasn't expecting to love it so much but dang it was so good. I was hooked from the first couple of pages. I loved it!!! I can't wait to see what happens in the next book. L. Filloon - L. Filloon was born in Leone, American Samoa. At a young age her family relocated to Hawaii and settled on Oahu. In 1977, her father once again relocated the family, this time to San Diego, eventually making National City, California their home. Although she started writing during her junior high school years, it wasn't until late 2011 that she self-published her first book, The Binding; the first in The Velesi Trilogy. Book 2, The Drifting, will be available on for Kindle on November 9, 2012. The final installment to be released in 2013.